The classic 1950 comedy starring James Stewart is planned for Blu-ray this March 6. 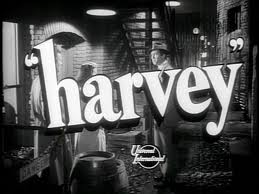 In an early announcement to retailers, Universal has revealed 'Harvey' will be released on Blu-ray on March 6. Based on the acclaimed stage play by Mary Chase, director Henry Koster's film focuses on a man named Elwood P. Dowd who is friends with a six-foot tall rabbit. The Blu-ray/DVD/Digital Copy combo pack will feature 1080p video, a DTS-HD Master Audio 2.0 soundtrack, and supplements include: Special Introduction by star Jimmy Stewart with photographic montage, Production Notes, The Carl Laemmle Era, The Lew Wasserman Era, and Theatrical Trailer. Suggested list price for the release is $26.98. You can find the latest specs for 'Harvey' linked from our Blu-ray Release Schedule, where it's indexed under March 6.